The Medical Entrance Exam like NEET UG, AIPMT etc a platform to gain entry into one of the prestigious medical college, is a tough to crack. Way of Study is slightly different for entrance exam preparation than theory exam. To crack entrance exam you require a deep concept oriented knowledge and lot of practice. Per year number of students gives entrance exam, but why only few student able to crack the exam in first attempt. Its only because of they follow a proper study plan or tips. Advanced preparation : Advanced preparation means doing study from the the starting phase with proper study planning. Students can be achieve extra than acceptations if they plan and prepare well in advance. Proper Guidance : A experienced and best teacher can guide you about which way is better study, which study material to read and tell the way to cover the syllabus of exam. They will help you in schedule and being organised in order to have an perfect study pattern. They give handful guidance for how to make and work on proper study plan. Practice is Importance : Your weakness can be reduced by practicing more mock and previous year question paper. It’s also helpful for you to know which concept are understood or not to study. Time Management: Time management is a vital point in preparation of various entrance exam and achieving command in it. For proper time-management, also check out your efficiency and working potential and schedule according to this. Interest in the Subject : candidates can easily clear this hard exam if they have interest in it. You must have an interest in basic subjects like Chemistry, Physics and Biology. If you are weak in any subject or topic then work hard on it with regular basis and achieve the command on fear of failure. Motivation and Meditation: You must keep yourself calm and motivated at the time of preparation and Stay away from negative thoughts. Some time you feel it’s not possible for your because of huge syllabus and toughness level, but you should keep your spirits high With a strong will and determination they can help to pass through any difficulty and this power can gain by meditation. Constant Revision and practice : If you’re doing advanced preparation then do consistent revision on already covered syllabus, because there are chances of forgetting studied point due to hugeness of syllabus. So constant revision is required for proper preparation and productive results. Stay Updated : keep yourself updated about entrance exams syllabus, important dates and other relevant information. Balanced Diet and Recreation : Healthy Food and daily exercise also contribute in better exam preparation. You can't study everything in single day. So try to maintain a healthy lifestyle by avoiding overnight study. 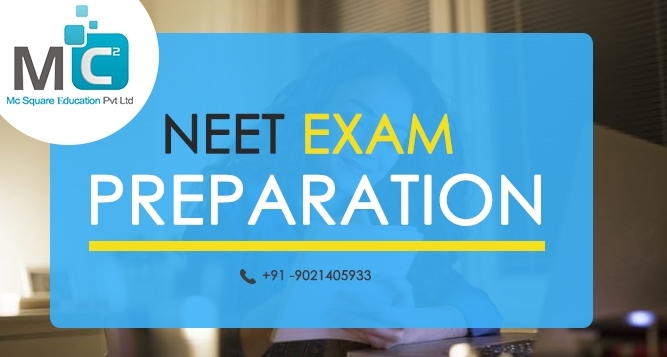 You can also consult with MC2 Academy is one of the top NEET Classes in Pune for better preparation. You can take advantages of lot of practice test series and helpful guidance from experienced faculty.